agroecosystem – One Billion Hungry: Can We Feed the World? A new book launched last month at World Water Week in Stockholm sets out the challenges the world faces in feeding a growing population in the face of severe resource constraints and climate change. Authors of the book, the CGIAR Research Program on Water, Land and Ecosystems in partnership with the United Nations Environment Program (UNEP), emphasise the importance of adopting a new way of farming, viewing farms as interfaces between achieving global food security and environmental protection or in other words as agroecosystems. With a focus on water, the book details the importance of ecosystem services for the direct provision of food and as the ecological foundation upon which agriculture rests. In a recent UK government report ecosystem services were estimated to benefit the UK economy by as much as £1.6 billion per year with pollinators contributing some 13% of the country’s annual income from farming. Not only are these services under threat from farming systems that degrade the resource base but from such global hazards as climate and demographic change. 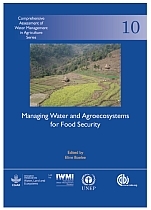 The book, Managing Water and Agroecosystems for Food Security, not only details the challenges we face in providing enough food to feed the population and the importance of water for agriculture and a range of other ecosystem services, it also provides practical approaches to managing water for agroecosystems. For example, increasing water productivity across a range of food producing industries as well as market mechanisms such as Payments for Ecosystems Services. As the authors acknowledge, however, an agroecosystems approach will require societal and political change at the local, landscape and global levels.